On December 4, 2015, President Obama signed into law the Fixing America's Surface Transportation Act, or "FAST Act" - the first Federal law in over ten years to provide long-term funding certainty for surface transportation. The FAST Act authorizes $305 billion over fiscal years 2016 through 2020 for the Department's highway, highway and motor vehicle safety, public transportation, motor carrier safety, hazardous materials safety, rail, and research, technology and statistics programs. The FAST Act increases the focus on roadway safety infrastructure and on the safety needs of pedestrians. The act also continues the focus on accelerating project delivery, adds a new freight formula, expands the freight network, and adds a new discretionary program for nationally significant freight and highway projects. This is the first time that Federal funding, approximately $1.2 billion per year, is dedicated to freight projects, including multimodal projects. For more information on the FAST Act, please click here. On November 3, 2015, Texans voted on and approved Proposition 7 (Prop. 7), a constitutional amendment to dedicate portions of revenue from the state’s general sales and use tax as well as from the motor vehicle sales and rental tax to the State Highway Fund for non-tolled projects. The additional funding from Prop. 7 will enable TxDOT to put a greater focus on infrastructure improvements without new taxes, tolls, fees or debt. Starting in 2018, once state sales tax revenue exceeds $28 billion in a fiscal year, the next $2.5 billion of revenue will be directed to the State Highway Fund. Then, beginning in 2020, 35 percent of the state motor vehicle sales and rental tax revenue in excess of $5 billion will be directed to the State Highway Fund. These funds can only be used to purchase right of way for, and build, maintain, and rehabilitate non-tolled public roads and to pay down certain transportation-related debt. On November 4, 2014, Texas voters overwhelmingly approved the ballot measure known as Proposition 1 (Prop 1), authorizing a constitutional amendment for transportation funding. Under the amendment, a portion of oil and gas tax revenues that typically go into the Economic Stabilization Fund will be deposited to the State Highway Fund. The amendment did not create any new taxes or fees. 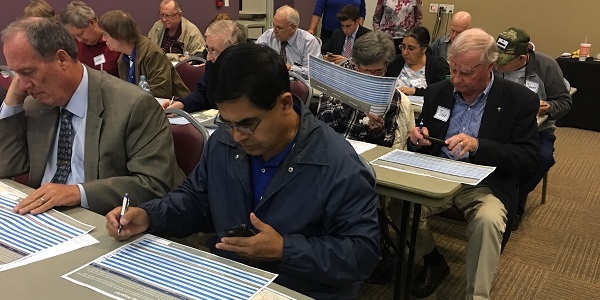 Locally elected officials, planning organizations and TxDOT officials collaborated to identify projects that effectively address the needs outlined for the use of the funds. This plan was approved by the Texas Transportation Commission (TTC) in February 2015. As of December 2015, the TTC had approved final contract awards on 165 of more than 200 planned Proposition 1 projects across the state. Once funding is authorized at the state or federal level, it is sent to urban areas through state departments of transportation for funding multi-modal projects in each region's short and long-range plans. Various funding categories are established at the statewide level in order to properly administer the State's transportation funds. Funding is then distributed to each MPO area through various formulas. With declining federal and state gas tax revenues due to more efficient vehicles, and a decrease in driving due to higher gas prices and an unpredictable economy, it has become difficult to reasonably project future funding streams for programming projects in the area's long range Metropolitan Transportation Plan (MTP). The MPO continues to seek new partnerships and to identify funding programs as they become available in order to advance transportation projects. Projects listed in the long range transportation plan are selected through the MPO's technical analysis and public involvement process. Since the long range plan is a financially constrained plan, projects may only be programmed up to the amount of anticipated funding for the 25-year period covered in the plan. Even with the passage of Prop 1 and Prop 7, the transportation infrastructure needs of the region are far greater than future funding amounts anticipated over the next 25 years. However, the MPO and its planning partners will continue to find innovative ways to preserve, maintain, and expand the region's transportation infrastructure.